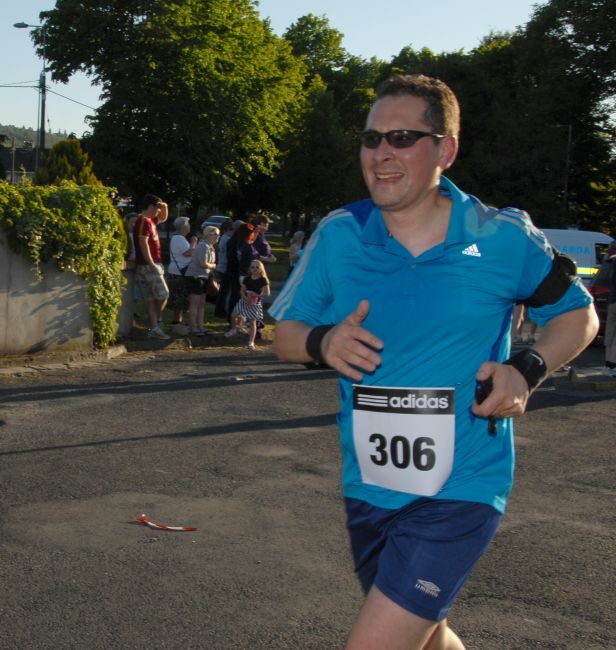 This run was close to home, in Carrick-on-Suir and the middle race of a 5 run series organised by the Carrick Roadrunners. Twas a hot and humid night in Carrick, so I was juicing up however I definitely did the wrong thing by have some peanuts some hour or so before the race, but more than that a little later ! The start of the race was by the tutor castle in Carrk and I must admit I’ve seen the signs, passed the town a million times however I had never ventured up the small street to see the house nor castle so it was great to final set eyes on it. The start was bunched but I tried my utmost to stay calm and take it easy through the first mile. This first mile took us up through the main street of Carrick which was great fun, and I’m glad I took it easy as the first hill we hit was at least one of the Deadmen, the title of the race was referring to. That first hill was long but I felt good going up through that first 2 miles, however at this point I hit another steeper hill and for sure this caught me, the wheels were a turning but the rubber wasn’t really hitting the road, and I was at a snails pace. Then to top it off those damn peanuts started to dry out my mouth terribly , it just went barren and not a drink of water in sight, I was rightly of course by this stage. I think it was the three mile mark that we hit a water station, and not longer we started to hit the down hill section. More wows as my technique was slightly off and didn’t get the power in, I was feeling a bit frustrated at this stage. A few people passed and I couldn’t keep up but as I reached the line I heard a few words of encouragemnet to get me across the line, Niall an ex-colleague from the TSSG was there cheering on with family and when they spotted by I got a great cheer. I crossed the line and off the stopwatch (I had lost my running watch) I caught a time of 0:34:04 and the official timer [pdf] had me at 0:35:08. I cleared the finish line feeling a little disappointed but then in talking to others they made it clear that the heat and those Deadman hills had slowed up most people on the run, so maybe not so bad after all.